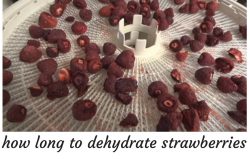 Category Archives for "How Long to Dehydrate"
Have you ever tried drying strawberries in the food dehydrator? Do you know how long to dehydrate strawberries? We know that there are lots of people around us who love to eat dried strawberries as snacks. With the aid of a food dehydrator, you can easily and quickly make it at your home. It needs very less time for preparation also before drying. It does not matter that which brand of the food dryer machine you pick for drying the strawberries, but the only thing which is essential is the uniform drying of all the fruit slices. So, let us tell you that how long to dehydrate strawberries! 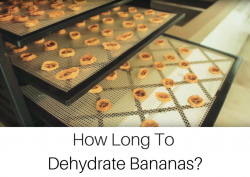 How Long To Dehydrate Bananas? Sometimes we don’t have much time at our home to eat the bananas. If you didn’t eat them on time, you might end up throwing them in the garbage. Is it a right thing to do? We know nobody wants to waste food and money. Getting a food dehydrator at home can help you in saving your lots of bananas. It’s quite easy to dehydrate bananas in the food dehydrator. Many of you who are new to the food dehydrator must be thinking that how long to dehydrate bananas?